Preheat oven to 180°C. Whisk egg whites and cream of tartar until soft peaks form. Slowly add 340g of caster sugar and 4 tsp cornflour while whisking until thick and glossy. Gently fold in vanilla and vinegar, transfer meringue into a piping bag with round nozzle and refrigerate. Sift 500g of the flour, rub through chilled butter with fingertips to form crumbs. Add egg yolks and ice water, to form a dough. Roll into a ball, press into a thick disc shape then wrap in cling film, chill for 30 mins. Roll out on a floured surface and press into a 30cm tart tin. Prick pastry with a fork, line with baking paper, add weights (dried rice or beans). Blind bake in the oven for 10 mins, remove paper and weights bake for a further 10 mins. Remove from the oven. Increase the oven temperature to 200°C. For the lemon filling, put the remaining caster sugar, plain flour, lemon juice, zest and 60g cornflour into saucepan on medium heat, whisk until smooth. 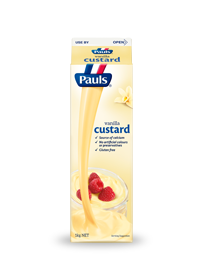 Add the custard and continue to whisk over heat until it thickens. Pour the lemon filling into the pastry case. Pipe the meringue over the lemon filling and bake in the oven for a further 10 mins. Allow to cool in the tin before serving.